Size: 9 x 9 inches. City: Paris, engraved by Inselin. Eusebio Francisco Kino From: Lettres Edifiantes et Curieuses. Father Kino's famous map was the first map to accurately depict the California region, in particular the relative positions of the Colorado and Gila rivers and the correct localization of the rivers, valleys and mountains of part of Sonora and Arizona. 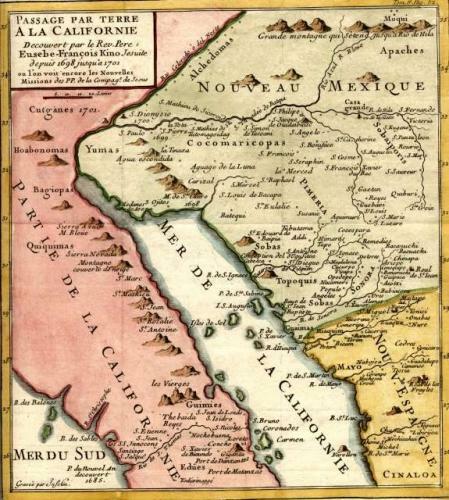 Kino's map, first published in 1705, was intended to disprove the California as an Island theory, but instead actually fueled the controversy and thus the map was reprinted many times. The map was very accurate and remained one of the best maps of the area into the twentieth century. An essential map to any collection concerned with the development of Californian cartography. Ref: cf Wheat [TMW] 89; Wagner 483; Schwartz & Ehrenberg plt 75.